Since the early days of RC flying, pilots have been giving landing advice, particularly if there is any sort of wind involved. 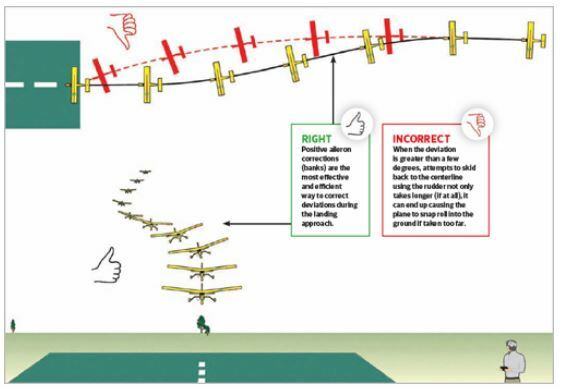 However, some have recently been getting it backward when they state that during a normal landing, the ailerons should be used to keep the wings level and the rudder should be used to steer the plane as it approaches the runway. Trying to correct deviations greater than a few degrees with the rudder has, in fact, led to hundreds of full-scale fatalities and countless crashed models over the years. While this misplaced advice might be “good for business” for some (it leads to more replacement fuselages and airplanes being sold), it’s extremely wasteful and largely avoidable with proper instruction. When listening to sport fliers, it’s obvious that the over-emphasis on rudder during landing is due to the assumption that expert pilots use rudder a lot in general, especially to counter wind during aerobatics. Since a landing in wind supposedly requires more skill, the belief is that the key to good landings must lie in mastering the rudder like the pros. Powered with a G62. Too bad Yellow went out of business they made great kits.